Media captionFormer editor of the Daily Telegraph Will Lewis recalls talking to the Queen after publishing MPs' expenses details. 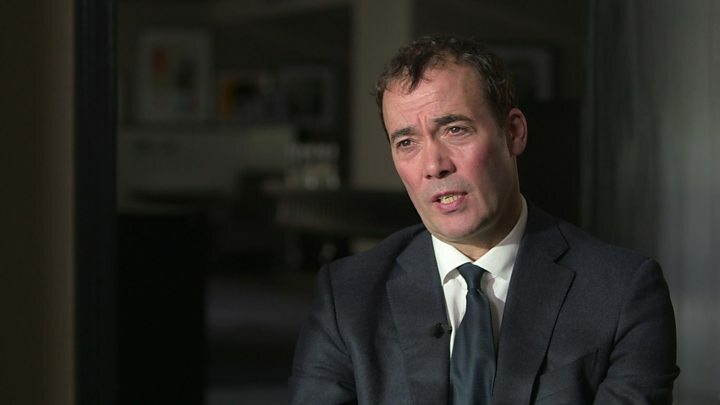 The editor who broke the story of the MPs' expenses scandal in 2009 has told BBC Newsnight he was "even more resolute" to continue investigating after talking to the Queen. Former editor of the Daily Telegraph Will Lewis said he had a private conversation with Her Majesty at the height of the newspaper's coverage. He was left "full of resolution" to continue "right until the end". Many MPs stood down as details of their expenses claims were published. Mr Lewis said the conversation with the Queen happened at the Chelsea Flower Show in London. "No-one was coming to our garden," he told Emily Maitlis. "When a man came scuttling along and whispered in my ear that Her Majesty was on her way… and we had a very nice conversation and I was able to afterwards hotfoot back to my office even more resolute and even more robust in my desire to continue with our investigative efforts." Mr Lewis added that while he "would never say what Her Majesty said to me... I did go back full of resolution to continue our investigation right until the end". The comments form part of a special one-hour Newsnight documentary, 10 years after the scandal. Mr Lewis said he felt "obliged" to publish a story that others had turned down, and described what his newspaper uncovered as a "very serious situation punctuated by things that people found funny but actually frankly were disgusting". A number of politicians were convicted for false accounting and the scandal prompted the establishment of the Independent Parliamentary Standards Authority (IPSA) - which monitors MPs' pay and expenses. I still catch myself, occasionally, thinking of individual parliamentarians by their corresponding household object. The Hobnobs and the trouser press, the duck house and the wisteria. The loo seat - make that two loo seats - and the lamps. The story touched a public nerve at the time. It came in the wake of the financial crash when belts were tightened and the pain was felt across the country. It came in the years following the Iraq war - when many felt they had been sold lies by the government of the day. The expenses scandal exposed a kind of wholesale wrongdoing. It wasn't about individuals - despite their memorable home appliances - it was the sense of a systemic rot that people were only just beginning to understand. Former Archbishop of Canterbury Dr Rowan Williams - who was also interviewed as part of the programme - described the scandal as a "watershed moment" with regards to the falling levels of trust voters currently have in the political system. "Where we are now with people's attitudes to parliament has something to do with that. I'm absolutely sure of that," he said. You can watch Expenses: The Scandal That Changed Britain (A Newsnight Special) Monday 25 March, 9pm, BBC Two or on iPlayer, subscribe to the programme on YouTube and follow it on Twitter.